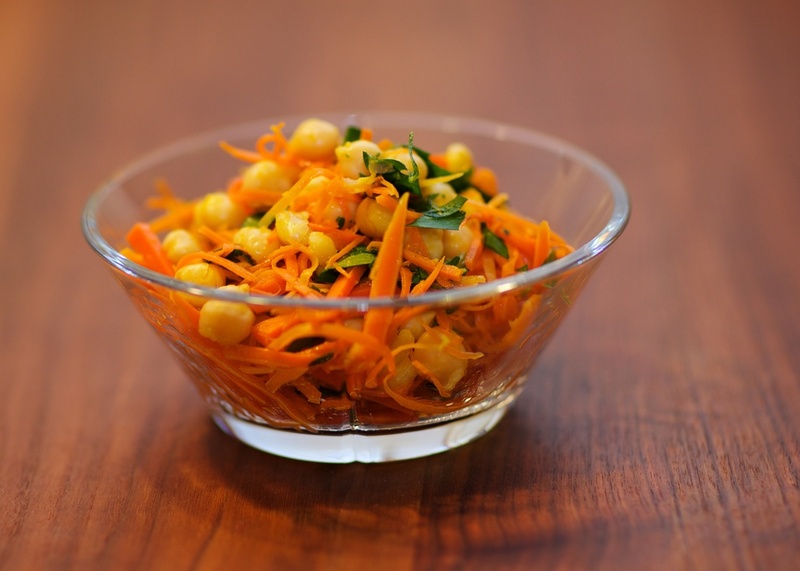 Chickpea and carrot salad a la Thomas Keller. This is an easy salad, when you have soaked and cooked the chickpeas. When you make it from dried, in stead of canned, chickpeas you'll get the a better texture. But no matter what its a good and healthy salad. Thomas Keller hit another home run with this one. Drain the chickpeas, put then in a large saucepan, and ad water, leek, bouquet garni, onion and carrot, and bring it to a boil. Reduce the heat to a simmer for about 45 minutes, or until the chickpeas are tender. Pour the chickpeas and their liquid into a large shallow container and let cool. Once they are cool, remove and discard the bouquet garni and vegetables and season with 1/2 teaspoon salt. The chickpeas can be covered and refrigerated in their liquid for 2-3 days. If you use caned chickpeas,C here where you start. Combine the olive oil, bay leaves, garlic, and thyme in a large skillet and heat over medium heat until the oil is hot. Add the julienned carrots and toss in the oil for about 1 minute to cook them slightly. Add the chickpeas and season to taste with salt and pepper. Toss the chickpeas for 1 to 2 minutes, then transfer to a bowl let cool. The salad will keep in the refrigerator for a day. Just before serving, remove bay leaves, garlic, and thyme and stir in parsley and lemon juice.